Three Parks Independent Democrats and West Siders For Responsible Development waged a two year campaign that won zoning limits on the avenues and side streets of our community thereby blocking construction of more forty story towers. The Mayor has now slammed neighborhoods here and around the city with his new rezoning plan. In the name of building "affordable" housing, de Blasio intends to rezone the entire city with a one-size-fits-all blueprint that does not allow distinctions by neighborhood. The problem is that except for six specific neighbor- hoods, the one in Manhattan being East Harlem, there is no requirement that any affordable housing be built when a developer takes advantage of increased height opportunities to construct luxury apartments. The most troubling aspect of the plan is that even a small boost in zoning height makes it profitable to take down or gut rehab existing low-rise rent stabilized and affordable units. While we will not yet see a return to Extell Towers heights, there will be increases in the two- to four-story range above the maximums now allowed, and a few additional stories will be added if 20 percent are below market rate "inclusionary" apartments. A statement just released by our Borough President Gale Brewer, and signed by 27 Manhattan elected officials says, "While the proposed zoning text will make it easier to create new apartments in contextual districts, there is a real concern this will create development pressure on existing buildings. In order to build those new, market-rate units, rent stabilized tenants may have to be displaced, resulting in a net loss of affordable units." A net loss of affordable units! How can that be the result of an affordable housing plan? First, the City has made no projections of a net gain in affordable housing. They are relying on the hope that something will come from giving developers the ability to make even greater profits. Second, there is no protection in the plan for existing rent stabilized and affordable units. The plan does provide a small sum to help tenants fight eviction, indicating that the Mayor is aware that there will be evictions, but there is no rule that affordable units cannot be demolished, or that they must be replaced by comparable new units with the original tenants invited back at the same rent. Only a year ago, two empty brownstones on West 83rd Street were purchased by a developer and plans filed to demolish them and put up one new condo building with six very large floor-through apartments. If the new zoning is passed, that developer will get an approximate bonus of two more floors plus extending the first floor into the back yard. The block has the same zoning designation "R8B" as do the side streets in our area. Another example of what can happen is the row of three brownstones on West 104th Street. These buildings have a total of about 24 units, most of them stabilized. They are two stories below the current zoning limit. Add the two more stories from the new zoning plan for a total of four, and there is incentive to take them down. With air rights purchased from brownstones across the street or directly in back, these currently four-story building could go to nine or ten stories with no affordable housing. What's more, they would get a generous 421-a tax break. Thanks to Gale Brewer, our local elected officials are alerted to the problem, as is Community Board 7, but we must keep pressure on everyone to have this plan stopped. As District Leader Cynthia Doty said at a recent Board 7 committee meeting, "The way to get affordable housing is to build it, not to bribe developers with tax breaks and permissive zoning that undermines protection that communities like ours fought to hard to win." 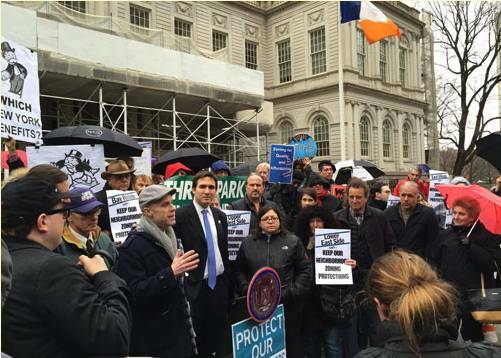 Three Parks joined leaders of housing and neighborhood presevation organizations on the steps of City Hall. Front center: Andrew Berman, Council Members Ben Kallos and Rosie Mendez. What is Affordability in the Mayor's Plan? New York City has many very different approaches to making housing affordable, including construction, rent subsidies for tenants, rent stabilization and rent control, tax abatements for developers and zoning height bonuses for developers. In addition unions, cooperatives and not-for-profit organizations have built affordable housing. The affordability of any particular apartment may result from a combination of these. Most of what it is hoped will provide incentive for developers to build affordable housing under the relaxed restrictions of the Mayor's proposal is the Inclusionary Housing Program. If 20 percent of a building is comprised of affordable apartments, additional stories can be added to the building's height so that the market rate rents, in effect, subsidize the affordable rents. Under this program, the affordable apartments don't have to be in the same building as the market-rate ones, they do need to be within the same community board district or within half a mile. At present there are no restrictions against the "poor door," a separate entrance for the non-market rate tenants who are often barred from using building facilities such as an exercise room. In New York, this amounts to nothing more than legal class and often racial discrimination. The concept that the wealthy subsidize the poor is not at all a bad idea. (It is the wealthy who can afford market rate housing in New York, particularly in Manhattan.) It should be carried out, however, directly through a progressive individual and corporate income tax with the housing built by the government. There is no necessity for diverting tax revenue funds to developers' profits which could be used to build houses. In Hong Kong, with a population almost equal to New York, half the people live in government-built housing with greatly subsidized rents. To qualify for NYC's 80/20 program, a tenant must have a gross family income under $42,950 for a family, and under $30,106 for a single individual. The tenant then pays 30 to 35 percent of income as rent. A family just at the upper income limit would therefore pay $1,074 a month. These figures are calculated on the 2014 area median income which changes annually. There are a variety of exceptions. For example, a developer who puts 50 percent of apartments into the affordable program instead of 20 percent, can rent to people who earn 120 percent of the area median which would be a family income of $100,860. In reality, these rents vary a great deal depending on what other programs and financing are involved. In any case, the likelihood if getting such an apartment is slim. Last year, a Brooklyn building with 105 affordable apartments opened and 59,000 people applied. In general, it is said that about 40 percent of all applicants are rejected for not meeting financial requirements. The rest go into a lottery. The Mayor's current plan deals with zoning not rent, and the actual text of the legislation has not yet been made public. There may be future modifications to the already existing Inclusionary Housing Program, or additional income or rent requirements added to the Mayor's plan. Not only does this plan fail to gurantee a net increase in affordable apartments by protecting existing below market rate units, but it violates the principal that the people of a community, in conjunction with their Community Board, have a voice in their own zoning. The real need for affordable housing should not become an excuse for centralized, city-wide zoning. Eight hundred of our neighbors attended a Community Board 7 meeting during the 2007 campaign to down-zone our community. The Borough President's memo to the NYC Planning Commission signed by 27 Manhattan elected officials. Link to the City Planning Commission page with links to documents. The "Draft Scope of Work," is the most complete description of the plan issued so fa--166 pages.